For those of you searching for beautiful trekking paths, and for those of you who have never hiked in the past, there are some hiking tours across Kythnos that you shouldn’t miss. Most of the trekking paths start from Chora, and this is where you should be. Meet with others, local people and visitors and start your own magical path to this island. This is one of the most beautiful and exciting trekking paths. Start off by the village of Chora and find the local town hall, where all kinds of routes begin. Your adventure unveils right in front of the glorious and traditional church of Agios Theologos. 10 minutes later, the road is left behind you, and in front of you lays a beautiful paved trail that will go on for almost the rest of the hike. As the path starts to descend, it might get a bit more challenging and difficult. However, the beauty all around you and the view at the end of the road will completely compensate you. Take the time to breathe in and admire this spectacular view. On your right, you will see the mills of Dryopida, while in front of you in the horizon the island of Serifos sits quietly. Another, amazing trekking path that you should definitely follow all the way, till its end. 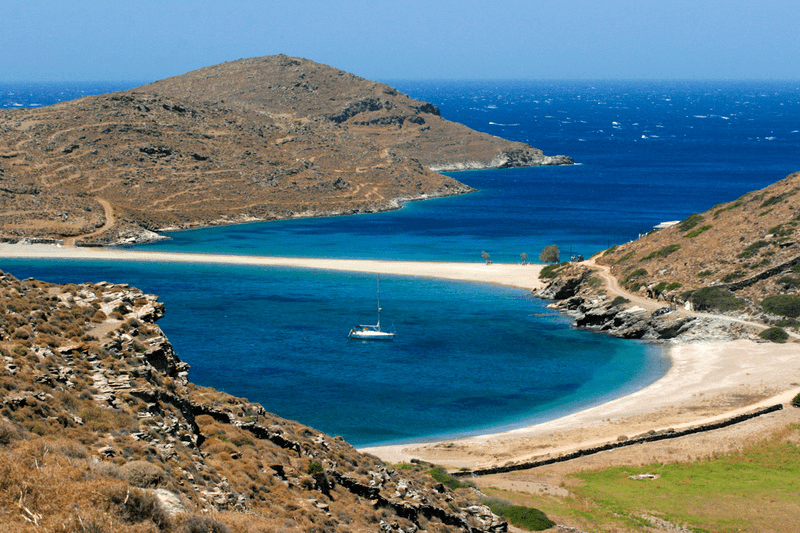 Starting from Merichas port, couple of hours later will lead you straight to the most impressive beach of the island. A long and narrow piece of land connects the main island with the small islet of St. Loukas. This is where you want to be at the end of a beautiful, yet tiring hike. Though a hiking tour might seem a bit overwhelming during your vacation, these hiking path will prove that everything in life worth experiencing, are a little hard to get. We, at Kythnos Bay Hotel, we will do everything in our power to make sure you have the most splendid traveling experience!